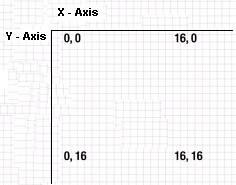 You can see that coordinates positioned at the upper left corner and X and Y axis points are set to 0 pixels. Lower right corner has been set to 16 pixels. Any item that will be part of this canvas is going to be positioned with accordance to this coordinates of the HTML5 canvas. The HTML5 canvas useful way to displaying data, but it should not be overused if standard elements of HTML5 can be used. For instance, canvas will be overkill if you can use H1 or TITLE HTML5 tags.